Now, some of you may know that I absolutely love Sassy Studio Designs. Not only are they are perfectly drawn, they kinda fit perfectly into my age range which means that they are perfect for birthday cards for my friends! So yeah.. I just think they are altogether perfect really! So, imagine my joy when I read that Sassy Studio were having a relay event! They basically give you the first fantastic image free, then if you make a card with it within the time limit, they give you another image free.... and so on! Well, the first freebie image is one of my absolute faves and one I actually already own - Sassy Cassie. A complete and utter Stacey card huh?! One day I promise that I will use something other than my pink and turquoise Copics....! 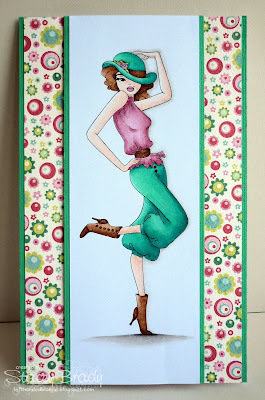 Stamps: Sassy Cassie - Sassy Studio Designs. 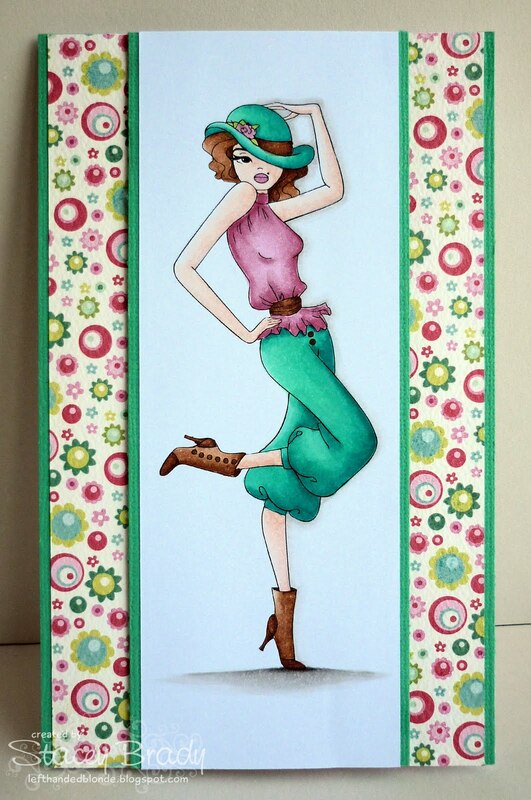 Paper: MME - Quite Contrary - Mary Mary - available HERE at Dies to Die For. Copic Markers: E00, E11, E29, E31, E33, E35, E37, E50, R20, R22, R81, R83, R85, BG15, BG23, BG49, W1, W3, W5, W7 - available HERE from Dies to Die For. So if you want to take part in the relay, make sure you visit Sassy Studio Designs ASAP! Very stylish hun!! Why change your colours?? If they're your favs you should keep using them. You blend them perfectly. Wow, she's gorgeous!! Your coloring totally rocks! LOVE the color combo and your coloring. This would make for a fun Christmas card too.